Hi loves! What is this, another Pahlish post?! Yes, something went wrong with the January samples and both Emily and I are sharing the collection released last month today. Good news though, because the Pahlish The Cake is a Lie had to be reformulated last minute it's still available :-). The inspiration for this set came from the game Portal, I haven't played this but I've seen my boyfriend play and it's very entertaining! Like I said, Emily from Very Emily is also sharing these beauties today so head on over to her blog if you want to see these polishes in another light (literally, she takes her pictures in daylight :-D). 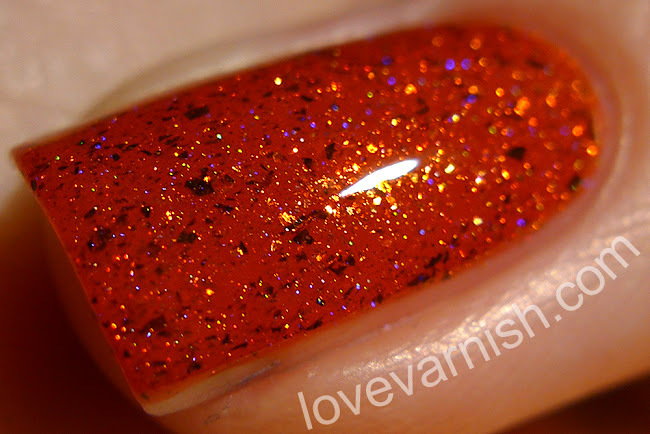 Pahlish Combustible Lemon II is an intense neon red/orange jelly with a mix of red and gold flakes with holographic flakes. Wow, we are starting of with a bang here! The intensity of this shade is SO good and the flakies really pop under the jelly base. I used 2 easy coats and topcoat, this one has that unique pigmented yet jelly finish. Pahlish Dangerous Mute Lunatic is a turquoise jelly with a mix of green iridescent glitters, gold flakes, and holographic flake. I personally wouldn't call it a turquoise, to me it's more of an evergreen shade with a hint of teal. Super duper gorgeous either way and a nice and opaque formula in 2 coats and topcoat. 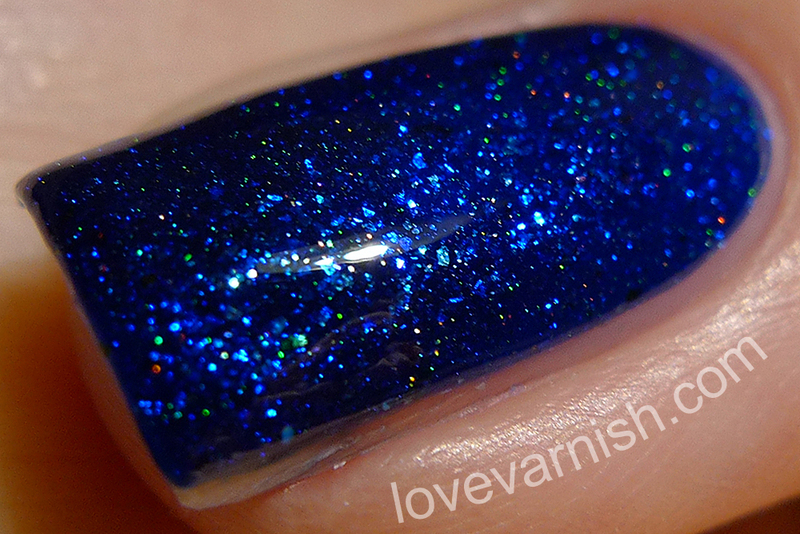 Pahlish Intelligence Dampening Sphere is a bright ultramarine blue jelly with holographic flakes and violet blue shimmer. Hmmm, so bold ♥. Blues like these are always so pretty and eyecatching and the shimmer and flakies light up the base making it glow a bit. Again, 2 coats and topcoat. Pahlish Married (to Science!) is a deep raspberry pink jelly with iridescent orange glitters, pink flakes, and holographic flake. When I was editing my pictures I realized I should have went with 3 coats instead of the 2 you are seeing here. My lighting made it a bit more see-through than it actually was and now the color seems a bit flat, which it wasn't in real life! 2 coats and topcoat. Pahlish Maybe Black Mesa is a violet toned black jelly with a mix of violet and purple glassflecks with holographic flakes. Nnnngggghhh so much pretty! I love how the black jelly intensifies with each layer and those violet and purple glassflecks pop so well, it's insanely beautiful! I used 3 coats for an intense look and topcoat. I adore the boldness of this collection, all colors are very bright and distinguished and filled with beautiful sparkles. My favorites are Combustible Lemon II and Maybe Black Mesa, though I highly recommend grabbing this set if you like bold colors and sparkly bits. The formula was really great on each polish, even coverage with each layer and nice build-up of opacity in 2 to 3 coats. Have you ever played Portal? And what do you think of this Portal-inspired collection? Tell me in the comments! Pahlish is a US based indie with regular restocks and reasonable international shipping rates. You can find more info in the webshop! The Cake is a Lie collection has been released already. Make sure to check the Facebook page linked below, as restocks are announced here.